Top Rank promoter Bob Arum says Manny Pacquiao has absolutely no interest in facing welterweight contender Terence ‘Bud’ Crawford. Arum says the fight Pacquiao (59-7-2, 38 KOs) wants is against WBA lightweight champion Vasyl Lomachenko. Pacquiao, 39, is willing to come down to 135 to make that fight happen. Arum doesn’t sound disappointed that Pacquiao is cool to the idea of facing the 30-year-old Crawford. It’s a fight that Arum has wanted to make for years, and there’s never been a willingness on Pacquiao’s part in taking it. One reason you can argue for that is the lack of a large fan base for Crawford. When you remove his home state of Nebraska from the equation, the counter-punching, switch-hitting Crawford hasn’t won over the casual boxing fans with his fighting style and his quiet personality. So, for Pacquiao to Crawford, he would be doing him and Arum a favor without getting much in return. The far better fight for Pacquiao would be against Lomachenko, who is starting to win over a lot of new boxing fans with his exciting all-action, high volume fighting style. Lomachenko is on his way to stardom and he just needs a big name like Pacquiao to get him over the hump. “He (Pacquiao) has absolutely no interest in fighting Crawford. He told me that himself,” Arum said to SiriusXM Boxing. “The guy he’s looking to fight is Lomachenko at 135 lbs. He says he can get down to 135 pounds. Sure, why not,” Arum said when asked if he likes the idea of Pacquiao fighting Lomachenko. Pacquiao hasn’t fought at lightweight in 10 years since his 9th round knockout victory over World Boxing Council 135lb champion David Diaz in June 2008. That was a one-fight deal for Pacquiao, who them immediately moved up to welterweight and destroyed former six-division world champion Oscar De La Hoya in stopping him in the 8th round in December 2008. Aside from his fight against Ricky Hatton at 140 in May 2009, Pacquiao has spent the last ten years fighting at 147. Pacquiao’s former trainer Freddie Roach often said that he would need to eat five meals a day to keep his weight over 140 lbs. It’s unclear if that’s still the case. If so, then Pacquiao might be the lighter guy against Lomachenko. ”Yeah, because you get dizzy watching Lomachenko and Pacquiao the way they’re whirling dervishes the way they swirl around and throw a punch and then they get out on the other side, both of them. It’s going to be an amazing, amazing fight,” Arum said. Pacquiao might be faster and more explosive at lightweight. That’s what some boxing fans believe. This will give people the chance to see if that’s the case. I doubt that it will be though, as Pacquiao has slowed down in the last three years of age rather than his weight. It might be premature for Arum to be talking of a Pacquiao vs. Lomachenko fight. Pacquiao is challenging WBA ‘regular’ welterweight champion Lucas Martin Matthysse (39-4, 36 KOs) on July 15 in Kuala Lumpur, Malaysia. If Pacquiao gets beaten by the 35-year-old Matthysse, then there won’t be any point of a fight against Lomachenko. 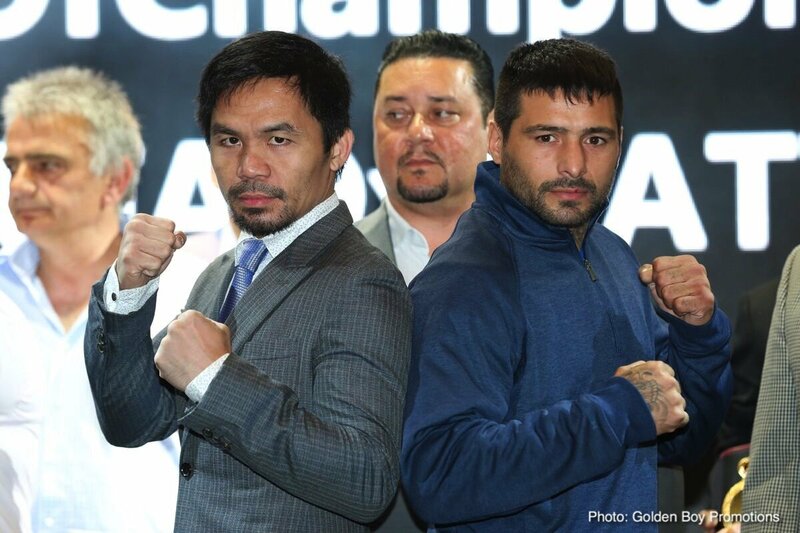 Pacquiao-Matthysse is a 50-50 fight in the eyes of a lot of people in the boxing world. Matthysse can still punch like crazy, and Pacquiao looked bad in losing to Jeff Horn last year in Brisbane, Australia. Horn outworked Pacquiao in beating him by a 12 round unanimous decision. It was a controversial win for Horn, but Pacquiao struggled throughout the contest with his stamina. He wasn’t able to fight as hard as he used to. If Pacquiao can’t fight hard against Matthysse, he’s likely to get taken out. Next boxing news: Alex Dickinson vs. David Howe on Fury-Seferi card this Sat.